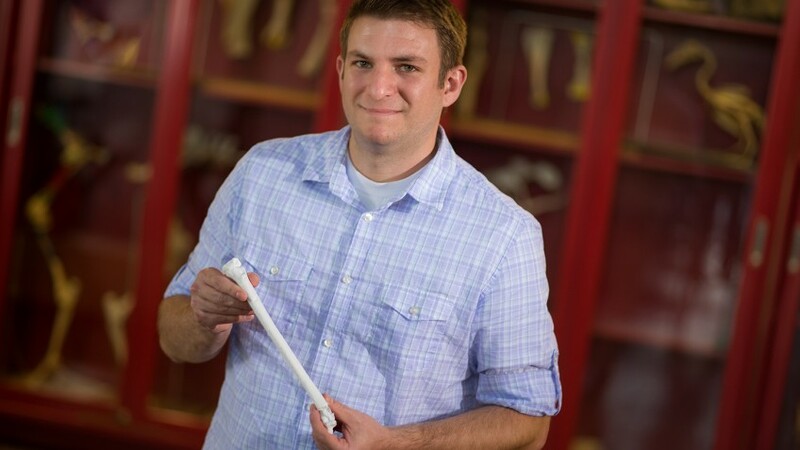 Christopher Walker is a research specialist at North Carolina State University’s College of Veterinary Medicine who instructs first year DVM students on the finer points of mammalian structure while teaching the veterinary anatomy and histology courses. Dr. Walker, who has a PhD in Evolutionary Anthropology from Duke University, is helping describe and analyze some 1,500 specimens from what is called the most astonishing human fossil discovery of the past 50 years, an incredible find that adds a baffling new limb onto the human family tree and is changing our understanding of human evolution. Walker and his colleagues are teasing out information on Homo naledi, a previously-unknown species of extinct hominin. Homo naledi is named for the Rising Star cave system 30 miles northwest of Johannesburg, South Africa where two recreational cavers discovered the fossils in 2013. “Naledi” is “star” in the South African language Sesotho. Walker is one of the 48 co-authors who formally announced the details of the discovery in the research article, “Homo naledi, a new species of the genus Homo from the Dinaledi Chamber, South Africa,” published in eLife, an online, open access journal of research in the life sciences and biomedicine. The project’s coordinator, paleoanthropologist Lee Berger of South Africa’s University of Witwatersrand, recruited Walker as a member of the initial research team of dozens of specialists that spent more than a month reviewing the find. The sheer number of specimens—almost every bone in the body is represented from some 15 individual adults and children—required the work be divided among multiple subgroups of scientists. Unusual findings at this stage: H. naledi exhibits some characteristics that are surprisingly human-like yet other aspects that are similar to our most primitive ancestors. A big mystery is that the remains were found practically alone in a remote chamber and were deposited over time with no indication of predator activity or water transport. The currently favored, but still largely untested, hypothesis is that H. naledi may have deliberately disposed of its dead. How did you come to be involved in the Rising Star Project? I first began working with Lee Berger, the coordinator of the Rising Star Project, in 2010 as a member of the team studying (the then recently discovered) skeletons of Australopithecus sediba from Malapa, located not far from Rising Star. In 2013, I was in the midst of a long trip, collecting data from immature human and African ape skeletons to investigate how certain bony features grow and develop, when the Rising Star Expedition was taking place. By the time I arrived in South Africa (as a planned stop on my data collection journey), hundreds of fossils were already out of the chamber. I’ll never forget Lee’s face, grinning from ear to ear, when he took me into a temporary holding area for the Dinaledi specimens. I glanced at the U.W. 101-1070 immature tibia (viewable at morphosource.org) and instantly knew he had something special; it was unlike any tibia I had ever seen. A few months later I was invited back to participate in a workshop, along with dozens of other scientists, where we excitedly worked 70+ hour weeks for a little over a month describing, comparing, and analyzing the treasure trove of fossils. What is your role on the research team? I was brought on to the team for my expertise in limb bone development. This work split me between three subgroups: upper limb, lower limb, and site demography. What does this research opportunity mean to you, at this point in your career, as a biological anthropologist and an anatomist? Hominin fossils are incredibly rare. Or perhaps I should say that they were incredibly rare. The remains from Dinaledi represent the largest fossil hominin assemblage ever discovered in Africa and there are still more fossils left to be recovered! I have a career’s worth of work ahead of me just in this single assemblage. To have the sort of unrestricted access to hominin fossils that I have been granted as an early career scientist, with both Au. sediba and H. naledi, is uncommon if not extraordinary, and has afforded me research opportunities not typically available in paleoanthropology to people my age ( I was 27 when I started work on H. naledi). Can you offer your thoughts about how this discovery could reset our understanding of human evolution? Homo naledi contributes to a growing body of evidence that human evolution was anything but simple. Thus far, the discovery has raised far more questions than it has answered. In H. naledi we find an unexpected combination of features. This species has fairly long legs and human-like feet, indicative of bipedal efficiency, but an upper limb anatomy that suggests these hominins were adept at climbing. 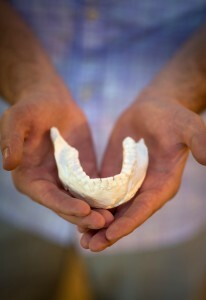 Brain size is small (like primitive hominin species), but so too are the teeth (which is a more human-like trait). Overall, H. naledi demonstrates how little is actually known about our own genus and the order of anatomical changes leading to humans today. The place of H. naledi in the human family tree, however, is still unknown. You have used NC State Library’s 3D printing capabilities to recreate several specimens from the Dinaledi Chamber. What for? My interest in the 3D-printed models is primarily for educational outreach purposes. Some of the prints have already made it into area classrooms, allowing students to hold the specimens that they’re learning about just a few weeks after the discovery was announced. Traditional methods of casting fossils are expensive, can damage the originals, and are generally slow. 3D printing is an economical and efficient method of getting the H. naledi fossils into the public’s hands. I owe thanks to NCSU Libraries for offering such a quick and affordable printing service. How unusual is it that the research team published the papers in eLife, an open access journal, and made 3D scans of many of the fossil freely available? Very. Paleoanthropology has been, and still is to a large degree, an exclusive field. Access to fossils is often tightly controlled, even after publication, impeding the scientific process. The Rising Star Project was, from the get-go, radically inclusive. Hominin fossils are not a resource to be monopolized, as they speak to the history of every person alive today. Publishing open access and uploading 3D scans was a conscious decision to facilitate public engagement and continued research. What’s next for you with the project? Everything, really! I’m a co-author of multiple papers that are currently in review, focusing specifically on the limbs and the breakdown of individuals in the chamber. Other studies investigating everything from limb biomechanics to proportions to tooth development are in progress. The story of Homo naledi has just begun. How does your work with Homo naledi help inform your research and teaching here at the College of Veterinary Medicine? If we found one of these individuals alive, but injured, today, we probably wouldn’t be sure whether to take it to the NC State Veterinary Hospital or Wake Med. The never-before-seen mosaic anatomy of H. naledi really highlights the need for a broad comparative anatomical perspective in studying these fossils. My work here at the College of Veterinary Medicine, involving a multitude of species, has greatly expanded both my knowledge of and interest in anatomical variation across vertebrates, which directly informs and improves my paleontological research. Moreover, developing hypotheses to explain novel morphologies, like those that we find in H. naledi, demands innovative functional-morphological and biomechanical thinking. I bring this to the classroom by emphasizing an integrative functional approach when teaching anatomy. Veterinarians treat animals, not structures, so I aim for students to not only be able to identify anatomical features, but also to gain a deeper understanding of anatomy by appreciating the relationships between form and function. In this way, paleontological research parallels clinical anatomical learning.